If you lived in Myanmar and a friend popped in to visit, this is the snack you’d serve. 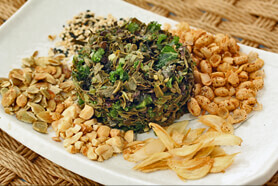 Lahpet, which means “green tea,” and thoke, which means “salad,” is an eclectic mix of flavors and textures that includes soft, pickled tea leaves, crisp, roasted peanuts and other crunchy beans, toasted sesame seeds, fried garlic and, if you like, dried shrimp and chopped tomato. It’s meant to be served with all the ingredients in separate piles so that guests can pick out a combination to their own preference each time they grab a handful. While nowadays the salad is typically served as a final course at the end of a meal, historically lahpet was an ancient symbolic peace offering that was exchanged and consumed after settling a dispute between warring kingdoms. Letting each person customize his or her salad toppings, sounds like a perfectly democratic way to stop an argument! That way everyone is at least somewhat satisfied in the end. Lahpet is so important to the culture that when tea leaves are harvested, the best of the crop is set aside for fermenting, while the rest is dried and processed for drinking tea. The freshly harvested tea leaves are briefly steamed, then packed into bamboo vats and set in pits, pressed by heavy weights to encourage fermentation. Packages of prepared laphet thoke ingredients—the tea leaves and all the other mix ins—are readily sold in Burma. Finding fermented tea leaves outside Burma and northern Thailand, however, isn’t very easy. The other option is to try fermenting the leaves yourself. Since most likely you won’t have access to fresh tea leaves, dried green tea leaves make a perfectly acceptable substitute. In this recipe I used Arbor Teas’ Organic Makaibari Estate Darjeeling Green Tea. It has lemony, vegetal and earthy qualities that align well with the other ingredients in the salad. If you’d like to play around with flavors, Arbor Teas also offers an Organic Darjeeling 1st Flush Black Tea from the same estate. Although the leaves are oxidized during processing, they retain many of the green tea characteristics in their flavor profile, tasting very dry and citrusy. Pour 4 cups of hot water over the dried tea leaves, stir, and let soak until the leaves have expanded and are quite soft, about 10 minutes. Then drain, pick through the leaves, and discard any tough bits. Squeeze out any remaining liquid from the tea leaves as thoroughly as possible. Next place the tea leaves in lukewarm water and mash with your hands a little. Drain and squeeze out extra liquid. Repeat this rinse once more, then add cold water and let stand for 1 hour (or as long as overnight). This longer soak helps to remove the strongest, tart and bitter edge of the tea. Drain, squeeze thoroughly to remove excess water, and discard any remaining tough bits. Chop the leaves finely and mix together with about 1 cup finely chopped kale, 1 loosely packed cup mixed chopped cilantro and scallion greens, 2 tablespoons finely chopped ginger, 1 tablespoon of garlic paste, a generous pinch of salt, and the juice of 1 lime. For an extra kick include 2 minced green chilies. Cover the dish tightly and allow it to ferment, untouched, for two days in a dark, cool space, like a pantry. After two days, place the container in the refrigerator. It's ready to serve! When ready to serve, set a wide skillet over medium heat. Add the sesame seeds and let them heat, shaking the skillet from time to time to ensure that they aren’t scorching. You will start to smell them toasting after a few minutes. Keep stirring so they don’t scorch, and cook for another minute or two, until they are golden. Transfer to a dinner plate and let cool completely. Next, heat the peanut oil over medium-high heat, add the sliced garlic, reduce the heat to medium and fry until just golden, about 5 minutes. Lift the garlic out of the oil with a slotted utensil and set aside on a plate to crisp up. Save the oil, now flavored with garlic, to use in the final dressing. Serve the salad unmixed, arranging small piles of all the ingredients on a platter. Toss the fermented tea leaves with the reserved garlic oil, a few splashes of fish sauce, and fresh squeezed lime juice to give an extra sour note. Add a generous pinch of salt, mix again, taste and adjust other seasonings if needed. Place the leaves in a neat pile in the center of the other crunchy mix-ins.